I love the Tweed Rides and Seersucker Socials that take place in Washington DC. Participants dress in vintage inspired clothing and ride bicycles around Washington. It’s the ultimate hipster American thing and despite not having gone for a few years, I kind of love everything about it. When I first met Jordan I asked if he’d ever go with me and he gave a flat ‘no’. 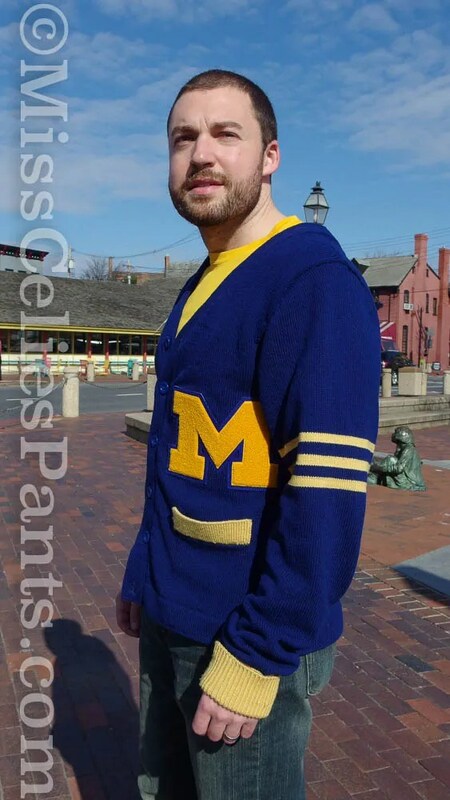 But, when I showed him a now discontinued Abercrombie University of Michigan varsity style sweater, he said if he had that, he’d go. Well, grab your craft beer and vanity monocle, Jordan. Because we’re going on a hipster bike ride. I decided to knit this sweater for Jordan’s birthday. The cardigan is drafted to his measurements using Garment Designer (which drafts for both sewing and knitting). I have found GD to have more ease than I prefer so I used the minimum ease option and tapered sleeves in the design. I think the fit through the torso is okay. And, I’m very happy with the length of the bodice. Where I failed, is that I’ve never made a sloper for Jordan from the program like I did for myself. I just assumed since mine fit so well off the bat his would be the same. I can’t say that’s true. I found the sleeves on this to be about two inches too wide and three inches too long. ** ETA: It looks like I added length to the ‘long’ sleeve. When I can pin him down, I’ll remeasure his bicep. The back neck also gaped pretty badly. So much so I that I machine sewed in two darts. This is a guess as I’ve never done this before: But, I think the neckbands are usually done in ribbing which has a lot of stretch and would pull the neckline in to the body. The plain stockinette bands should probably have been shortrowed around the back to add curvature. And / or I should have wet blocked some shaping in to them prior to applying them to the cardigan. If I were to make a stockinette neckband the same way, I would short row around the neck to snug up the fit. But, if you have other ideas, I’m all ears! Speaking of the neckband, I didn’t knit in buttonholes. I didn’t know what buttons I was going to use and wasn’t sure about placement since I was just knitting a doublewide band to length. So, I decided to machine sew the buttonholes after I bought buttons locally. I think the shoulders hit about the the right place too. Maybe move them in 1/4 inch. The back waist is a little large, but nothing some short rows (darts) couldn’t fix in the future. I also made a machine knit hem. Which I’ve actually never done before! 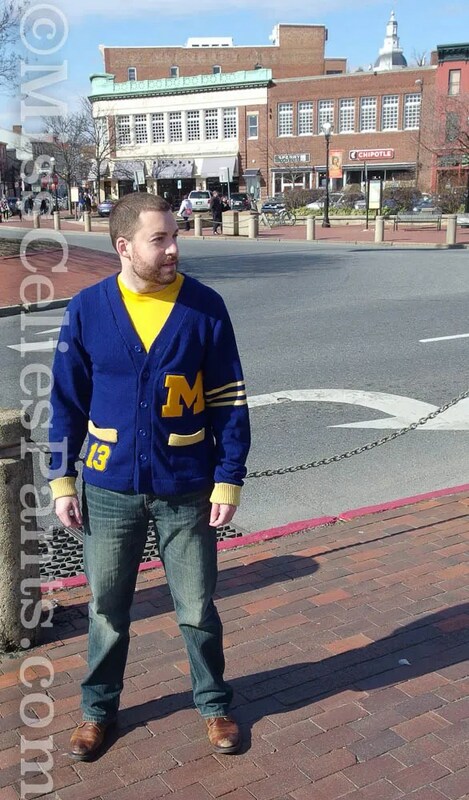 But, when I looked up vintage style sweaters online, I saw they used hems rather than ribbing for the bottom. Now, the yarn… oy. The yarn. I first bought the Cascade 220 Superwash. I read reviews for it online after purchasing and the reviews weren’t great. I thought I can make this work! I couldn’t. The yarn haloed (got fuzzy) and had a weird feel. I had to frog the first piece of sweater I knit and the yarn got super ratty and wouldn’t easily unravel. I decided life was too short and I could make hats from the leftover blue. So, I ditched that yarn for a lambswool from Colourmart and kept the daffodil color from Cascade fro the Michigan Maize. 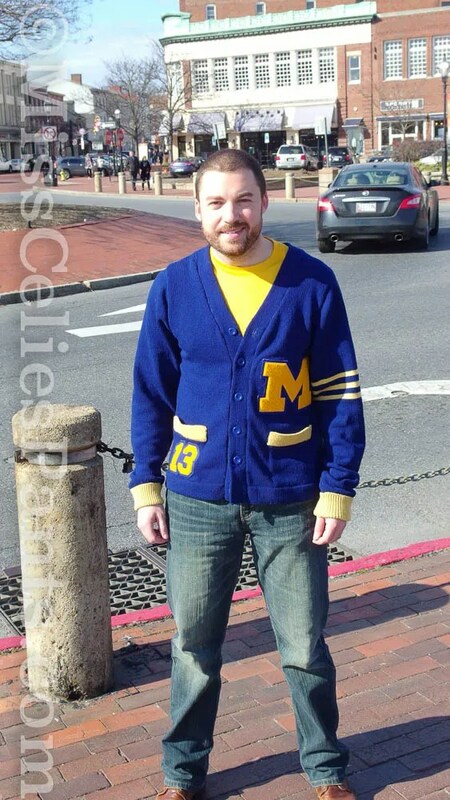 I ordered the Michigan M and the ’13 (the year he graduated law school) from Sunshine Chenille on Etsy. The M is perfect, I love the quality of the patches. But, unfortunately, the colors kind of clash. The M is more of a gold and the yellow I used is a pale butter color. But, I’ve decided to live with it and the other flaws. This was also the first time I knit pockets. It felt like magic! And, like sewing welt pockets. I knit these in 1×1 rib. I don’t LOVE them. But, I like that I was able to make them. I think this is the fifth garment I’ve machine knit? I tried several new-to-me techniques (pockets, hems, cardigan, sewing buttonholes on a sweater knit). I also learned a bit more about fit and how to best use my design software. So, it’s a win for me despite some issues. And, hopefully I’ll continue to improve! 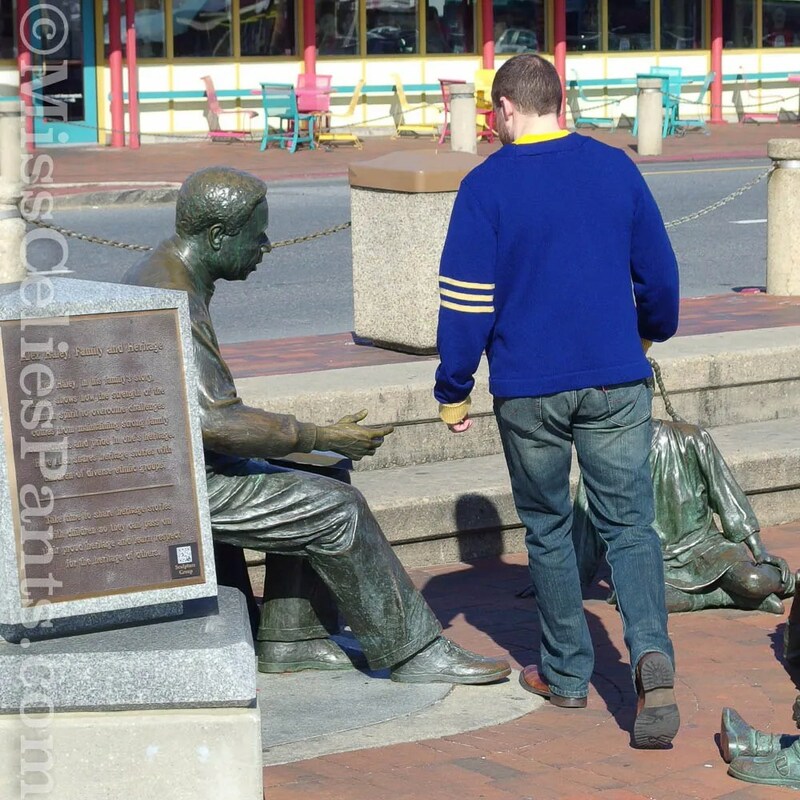 We took photos at the City Dock in Annapolis today where we met his parents for brunch. 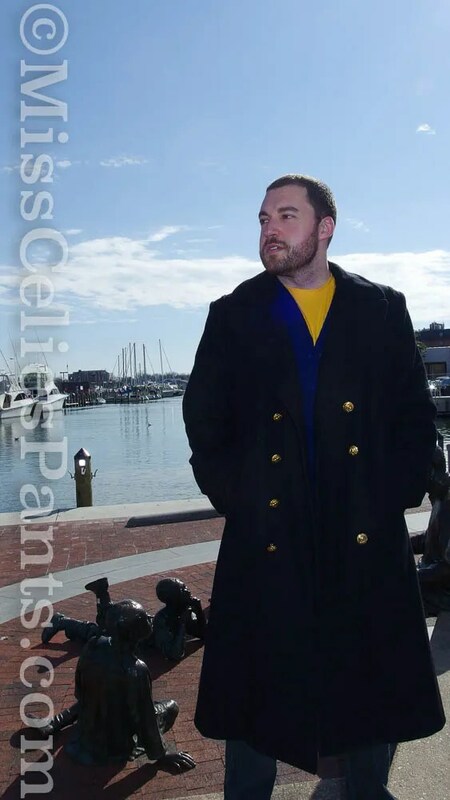 This naval officer coat was his Hanukkah gift in 2015. It’s heavy wool, resists rain and American made (and is apparently missing a button). I love it on him. Renee ~ I don’t care how many imperfections you see in this cardigan because I’m so proud that you made that! Dayum girl you should be too! That is simply amazing and like sewing you will get better with each one and refine the fit for Jordan. But Dayum girl you made him a cardigan!!! I’m so impressed! A super cardigan! 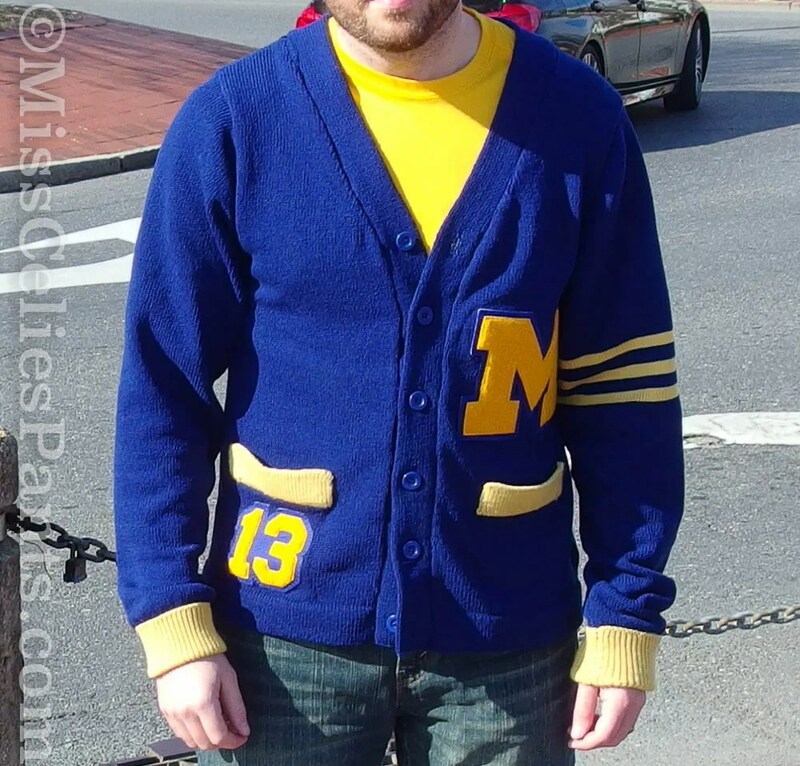 As I recall, letter sweaters never fit well; they certainly weren’t custom knit like this one! Jordan wears it so well, too! Did you knit the stockinette bands to be the same length as the front edges? I usually reduce them by at least 10 percent. How did you calculate the length. And obviously, you figured out how to do the buttonholes. Score for Renee! Jeannie – I’m old enough to actually REMEMBER letter sweaters and you are right – they were boxy – my memory of the bands were that they were vertically ribbed, not stitches picked up and ribbed. But this is definitely a style that suits Jordan. Without being super knowledgeable with sweater fit, I think I have his measurements wrong. Because it should be minimum ease throughout but it’s pretty roomy in the arms. I should have thought about that! I trusted GD to shorten the straps for me. But, it measured out to the exact length. When I sew a band, I would usually shorten it a little. The band didn’t have a lot of vertical stretch though. Maybe a straight back neckline? I’m not sure what is design flaw vs Jordan measurements. Each machine knitted project is even better than the last! I loved that cardigan you posted, but this takes things to a new level. You are clearly getting the hang of this machine knitting thing. And learning new pieces each time- those pockets look awesome. I like the different yellows together. What a great sweater! Terrific sweater and the model is very handsome. While I’m not quite old enough to remember letter sweaters on contemporaries, I think that they were usually pretty roomy. Thank you! I was really worried it was going to be too small. So, it’s good to know there’s enough ease! Absolutely a wonderful cardigan. Your so talented. I’m convinced you can make anything ! This is so great!! I love reading about your machine knitting adventures. It’s a double folded stockinette band. I don’t *love* the darts. But, the thought of doing anything else to this sweater gives me the sweats, lol! Thanks for confirming the need for neck shaping! I don’t know why I just thought it would magically work. In sewing, you’d shorten the neck band. But, some how it just didn’t occur to me. Despite the little imperfections you mentioned, this sweater is awesome! It looks really good on Jordan too! Remember this is the first one… You’re allowed for it not to be perfect! However, I really like it and think it is perfect! That is an amazing sweater and you did such an incredible job. Have fun knitting more cardigans for him. I cannot believe that you knitted this on a machine! It’s fabulous, really. I handknit, and fit is always a BOOGER when I knit for other people. 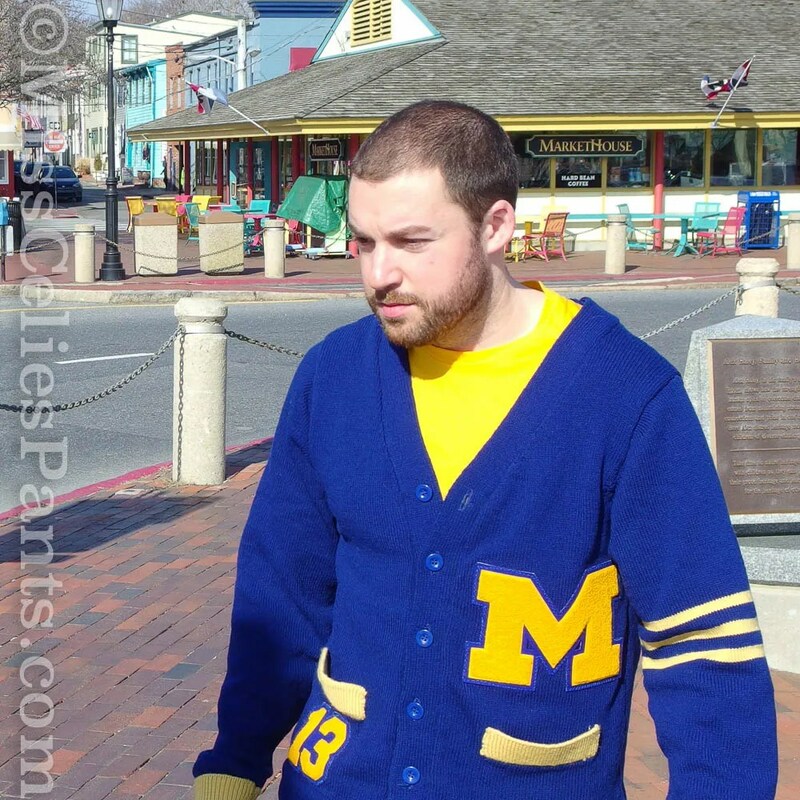 I think this is an amazing cardigan. The band is probably too long, but it’s bad when you get them too short as well. Then you have that puckering you see on cotton sweaters that shrink in length. So, that’s what I think is wrong. Jordan does not have a “square” shoulder profile, so I think a shorter band would bring the sweater in to fit him better. It’s a great sweater, and your skills just keep getting better and better. I usually knit a horizontal band just that is just a bit shorter than the sweater. 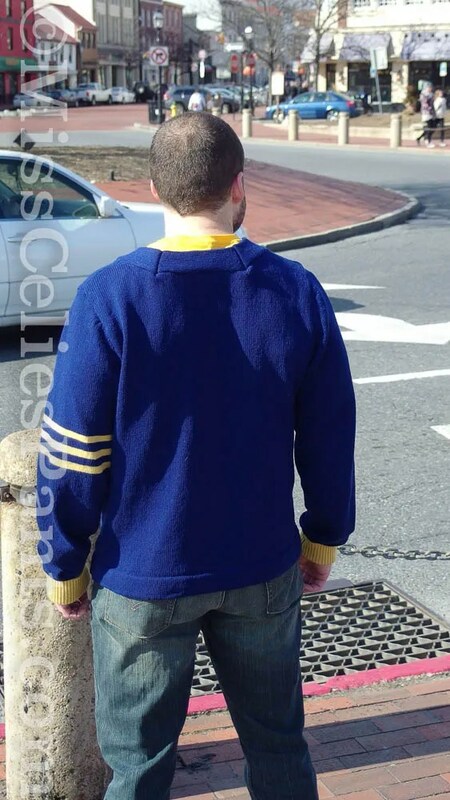 A horizontal band will not stretch vertically due to gravity and pull down on the sweater. We all pull down on our cardigans when we put them on, pull them together, etc, and it is easy for them to get stretched out when washing when they are knit vertically. You want the band to stabilize the front of the sweater. You might be able to get away with knitting a band that is exactly the same length as the sweater around the shoulders if it was knit horizontally since it wouldn’t stretch vertically. It is also common to use a grosgrain ribbon under the band to stabilize it if you are knitting a vertical band. Does this make sense? Did you knit the band separately? You probably said that in your post, but I don’t remember. This is such good information. No, I didn’t say. I knit the band separately and seamed it to the sweater. I do think I need to go back and add a grosgrain ribbon on the side I sewed buttons on so it doesn’t pull and sad. And, I think next time I’ll do the band in a stitch called ‘full needle rib’ which has more give. That way I get the vertical streamlined look I want, but can shorten it a bit so it curves around the back. Thanks! You are most welcome. I hope this helps, but keep us updated in your blog. We can fix this problem! This sweater is a TREMENDOUS achievement! Plus he actually put it on his body and allowed you to take pictures?!?!? Completely amazing you are!